Does the DU department celebrate national festivals or observe birth and death anniversaries of great Indian personalities? Is there a policy in place to check plagiarism? These form part of the questionnaire sent by the Delhi University to its departments ahead of the NAAC visit next month, an official said. The National Assessment and Accreditation Council (NAAC) will be visiting various departments of the varsity from October 29 to 31. 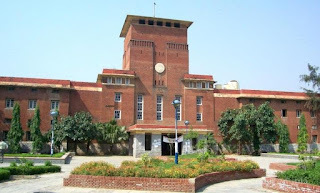 The grading provided by the Council is crucial for the funds and grants allotted to the varsity by the University Grants Commission (UGC), he said. In the lead up to the visit, the varsity’s mock teams are conducting visits to various departments and checking whether they are adequately prepared for the visit, a professor said. The administration had also recently mailed a questionnaire of 103 questions to various department heads in this regard. “Does the Department observe national festivals and birth/death anniversaries of great Indian personalities? Are committees in place for student-related issues?” are some of the questions mentioned in the questionnaire. The student-related issues include complaints of sexual harassment, gender sensitisation, safety of northeast students, and steps to check ragging and hooliganism. The questionnaire also sought to know whether there was student participation in committees. There are also questions on alumni associations in the department and whether they are constituted through fair and transparent periodic elections and their functions, the professor said. “Apart from these, there are also questions whether the department undertake any activities related to gender sensitivity (safety/counseling), and if it is equipped with mechanisms to check plagiarism,” he said.